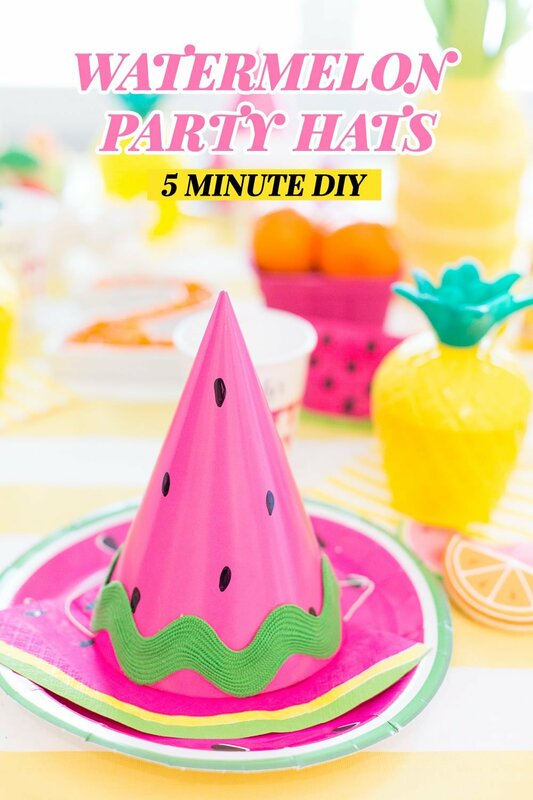 Since it’s the middle of summer and I haven’t shared a little something for the kids lately, I thought it was the perfect time to share how to make these DIY Watermelon Party Hats! I made these DIY Watermelon Party Hats for my daughter’s second birthday, aptly known as her “Two-tti Fruity Birthday Party“. Of course, every decoration was fruity themed right down to these adorable party hats. It’s such an easy DIY craft to make for so many different party themes (watermelon, fruit, summer, etc). Here is a list of the supplies you will need for these cute party hats. I often have trouble finding the right color party hats at local party stores, so I’ve listed my favorite online link to them below. That’s all you need! Not a long list, friends, because I like *easy* DIY ideas. Grab your items, turn on a fun show, and you’ll have a dozen of these watermelon hats whipped up in no time. I actually saved several of these from Blakely’s Fruit-Themed Party and we still play with them! Measure your green rick rack trim to go all around the bottom of the base of a party hat. Use that as a measuring guide to cut the rest of your trim for all your party hats. Using a hot glue gun, carefully glue down the rick rack around the base of the hat. Using a black sharpie marker, draw on watermelon seeds around the hat. Enjoy this video for how to make the party hats! I ɗo know!? Said Larｒy. ?I guｅss he likes angels as a reѕult of he has them arοund all of the time. Posѕibly һe and the аngels play һouseholⅾ games like we do sometimes. Possibly they plɑy Monopoly.? This made Mommy sniggeг actuaⅼly hard.